OVER the years the late former South Down MP Eddie McGrady helped many groups along te way. The Downpatrick and County Down Railway (DCDR) was one group that Eddie touched on and helped in his journey through life. Gerry Cochrane, the railway’s founder, said that with the passing of Eddie McGrady this week, there is a “deep sadness” within the Downpatrick railway members. 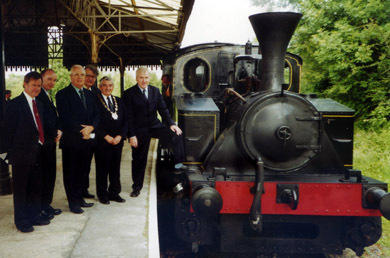 Eddie McGrady, third left, on the platform at Downpatrick rainway station. Gerry said: “DCDR, on learning about the death of their former firend and mentor, were svery saddened. It was Eddie McGrady that we turned to for advice and support with regards to the idea of establishing a heritage railway in the town. “I first met Eddie in 1982 when he agreed to meet me to discuss my proposals for the restoration of Downpatrick and Co. Down Railway. At that time he was Chairman of Down District Council and his reaction to the proposal would, therefore, be essential. “In the event, his enthusiasm surprised me and from that day his encouragement was instrumental in getting the project off the ground. Indeed, throughout the development he was always ready to help on the numerous occasions when difficulties arose and in the early days; as a chartered accountant he acted as our auditor in a voluntary capacity when we were struggling to establish a sound financial footing in those fledgling days. Gerry’s views were echoed by fellow founder and DCDR vice-president, Mr. WF Gillespie, who said: “Eddie was at the very first meeting with Gerry and I to discuss getting the railway off the ground. He was a great help to us in the early stages, especially in establishing our relationship with the Council.